Do you have young children or possibly bee allergies? Unwelcome bee hives or nests can be a dangerous nuisance. Learn how to get rid of bees naturally here. Bees are a vital part of our ecosystem, especially honey bees, which are in decline. They are incredibly important for cross-pollination, which helps plants fertilize and grow. That said, at the wrong place and at the wrong time, bees can be anywhere from annoying to dangerous. Bee allergies in the family, or simply having young children, may compel you to move or eliminate unluckily placed colonies. According to the National Pest Management Association, insect stings cause over half a million emergency room visits annually. No need to worry though….we’ve got you covered. We did some digging and created a full sting-free guide (sorry, couldn’t resist!) on how to manage, move, or get rid of unwanted bees. Carpenter bees: These are oval-shaped, and prefer to burrow into surfaces. While usually solitary and harmless, a large nest can damage wood in a house or other structure. 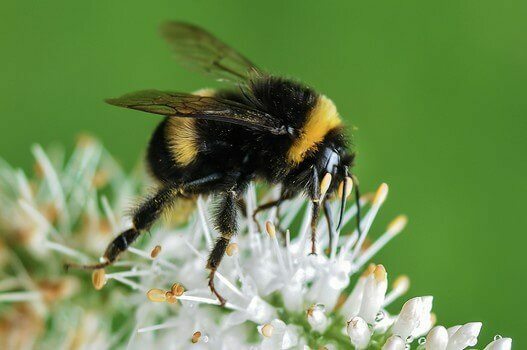 Bumble bees: Only aggressive when threatened, these tend to nest around loose material or underground. They tend to be yellow with fuzzy bodies. Honey bees: These bees are incredibly beneficial, but their nests can hold thousands of workers and may be both inconvenient and dangerous en masse. They are not aggressive, but will sting in self-defense. These bees necessitate relocation in order to preserve a threatened population. Look for a brownish-orange color as well as the characteristic fuzz. Wasps: There are several species of wasps which are easy to confuse with bees, including ground bees, and to a lesser extent, hornets and yellow jackets. For more help identifying stinging insects, check out this guide. Knowing what species of insect you are dealing with will help you locate its nest. Check the insect identification guide for more details, but, in general, look for nests in the corners of the roof, awnings, or walls, as well as near ready sources of food like plants and flowers. Be careful as you scout for the source of your problem – hives can contain as many as 50,000 to 80,000 bees! For more details on hives, check this resource out. Spray a vinegar mix. Mix a solution of 50% vinegar and 50% water in a spray bottle. Spray the area where the bees are living as well as where they congregate, such as near flower beds and plants. You can also try using a half-and-half solution of mild dish detergent and water. Mothballs. Hang them in a thin sock near the nest. Sugar lure. Fill a closed planter (or a large soda bottle) half with a sugared soda. Place it near the nest. The insects will be attracted to the food source and drown in the solution. Bug Zapper. Hang a zapper or a bug strip near a smaller hive. Fruit lure. Similar to the soda, cut up a bowl full of fruit and place it a few feet from the nest. Each day, move it further and further away until the bees relocate to a more preferable area, led by the food supply. Use natural repellents. Bees, like many insects, will avoid garlic, citronella, and (believe it or not!) sliced cucumbers. All of them emit an unappealing smell if you’re a bee. Diatomaceous earth. Food-grade diatomaceous earth acts like an organic pesticide without endangering the rest of the eco-system. If you do use a chemical insecticide, be sure to pick one that is appropriate for the species you are dealing with, and spray only at night. Make sure to remove the entire colony structure once you are certain the bees have been eliminated, otherwise it acts as an open invitation for resettlement by another colony. Note: There are a variety of ways to NOT remove bees successfully; here are a few that are ineffective and dangerous. Cover it with tarp and heat the hive. Pour gasoline or other inappropriate chemical onto the nest or hive. It will leach into the ground and hurt other animals and vegetation. Attempt anything that starts or ends with “Watch this!” Ever. Yes, this can chafe many a do-it-yourselfer’s heart, but sometimes it’s necessary. If you are dealing with honey bees, getting help to preserve them is an act of environmentalism. If you are dealing with a more dangerous insect, getting help is an act of intelligent self (and child/pet/dog) preservation! Some beekeepers may even be able to relocate the bees either for free or just expenses if the colony is in good shape and hasn’t been exposed to pesticides. Find a national directory of bee removal services here and call a beekeeper if needed. In any interaction with a stinging insect, there are some basic precautions to take, whether you are simply gathering information about the type of infestation you have, or are treating it. Always wear appropriate protective clothing. Be fully kitted out, including headgear with a net. Work at night, or whenever the hive is dormant. You can watch to see how many bees have left before approaching it during the day, but prepare to be surprised. It’s far better to make any removal or inspection attempts at night. Insects are often especially active at dawn and dusk when they enter and leave the hive. Be extra careful! Tread lightly near any insect hive or nest. Vibrations through the earth can agitate the insects. Keep in mind that if the nest isn’t near your house or where kids play, you may be able to leave it alone. Oftentimes, stinging insects use a nest for only one season before moving on. You may be able to wait it out rather than irritate the colony or use toxic chemicals. If you do believe a hive or nest has been abandoned, WAIT before removing it. Observe it for several days at different times to be sure before approaching it. Even then, make sure you are wearing protective gear. Finally, prevention can work better than any cure, in many cases. If you don’t have a stinging insect colony in your environs now, terrific. But, take a look around and determine how to make it unappealing in the future as well. Since bees scavenge for their food, sometimes in a several mile range from their homes, controlling the availability of food in your area is the trick. Remove food sources for insects by managing your food trash, and minimizing eating outdoors. If you do eat outside, be certain to clean very thoroughly once you’re done with your cookout or picnic. With carpenter bees, you can make the environment less appealing for nesting by making sure all outdoor wood surfaces are treated and painted. Carpenter bees seek out unpainted wood. For more resources, check out SafeBee and this home guide to organic ways to remove the bees safely. We hope you now have some ideas now on how to handle removing or discouraging bees, as well as how to prevent them settling in your neighborhood in the first place. Please let us know what has worked best for you – we’d like to share the wisdom of your experience! Sound off in the comments and stay safe out there!